A health trust that failed to properly investigate hundreds of deaths is to be monitored by an external expert. Health watchdog Monitor has appointed an "improvement director" to work with Southern Health NHS Foundation Trust. It comes after an inquiry was ordered in the wake of Connor Sparrowhawk's death while in Southern Health's care. An emergency board meeting was held on Monday after the inquiry showed the trust failed to investigate his and other deaths. 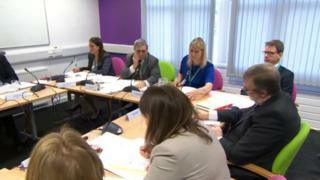 The trust has apologised for failings and said systems have improved. Monitor said the trust would now receive "expert support to improve the way it investigates and reports deaths" of people with learning disabilities. Mazars, an audit firm, published a report on Southern Health in December which said the deaths of mental health and learning-disability patients were not properly examined between April 2011 and March 2015. It blamed a "failure of leadership" at the foundation trust. The report was ordered in 2013 after Connor, 18, drowned in a bath following an epileptic seizure while a patient in a Southern Health hospital in Oxford. An independent inquiry said his death had been preventable, and an inquest jury found neglect by the trust had contributed to his death. Monitor said when investigating, the trust also failed to engage properly with families. The foundation trust covers Hampshire, Dorset, Wiltshire, Oxfordshire and Buckinghamshire and provides mental health services to about 45,000 people. Monitor has taken regulatory action and the trust has agreed to implement changes. Katrina Percy, chief executive of Southern Health NHS Foundation Trust, said: "We have agreed with Monitor that we will take a number of steps to show how we are improving. "These are implement the recommendations of the Mazars report through a comprehensive action plan, get assurance from independent experts on this action plan and work with an improvement director appointed by Monitor."